Here you can search for an institution or have a list of institutions displayed, depending on your criteria. Likewise you can use single search words. The input is automatically truncated at either end, i.e. the word ‚Baptist' would also find the words ‚Anabaptist' and ‚baptistry'. If no word is entered an unlimited search follows. For questions to the address database, if you can't find persons or institutions in this database or for ancestor research feel free to use our communication platform. Library of Congress Cataloging-in-Publication Data The Reformed family worldwide: a survey of Reformed Churches, theological schools, and international organizations / compiled and edited by Jean-Jacques Bauswein and Lukas Vischer. p. cm. 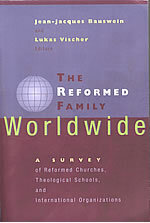 A project of the International Reformed Center John Knox, Geneva, Switzerland. ISBN 0-8028-4496-0 (pbk. : alk. paper) 1. Reformed Church. I. Bauswein, Jean-Jacques. II. Vischer, Lukas. III. International Reformed Center John Knox.